This is the list of email addresses that are blocked by Blocker. You can use wildcards (e.g. *@customername.com, myname@*.*). The email will appear to the sender to be sent correctly. This is the list of email addresses that are never blocked. You can use wildcards (e.g. *@customername.com, myname@*.*). Remember that SPAM blocking is only performed on inbound or relayed mail, so there is no need to add your own domains to this list. 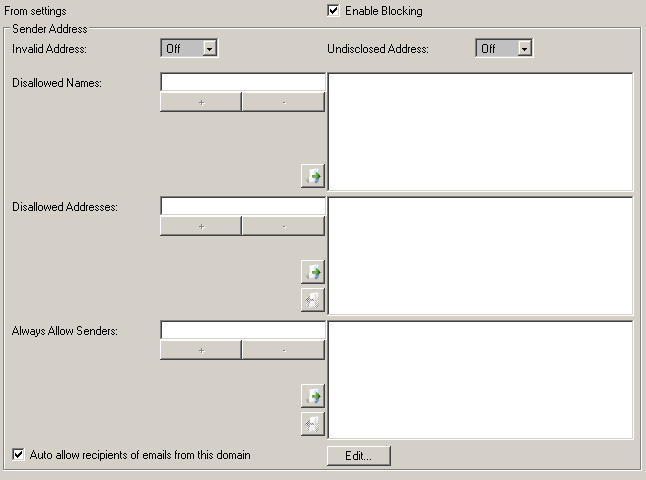 Note that the Disallowed Senders configured in the SMTP Server or the SPAM blocker Blocked Senders override this list. Email addresses are checked by the SMTP server module first for efficiency, and hence any email from blocked senders will not be processed by the SPAM blocker and this whitelist. Any recipients of email from users within your company can automatically be added to the list of users whose email will never be blocked. Press the Edit button to open the Whitelist management pages.